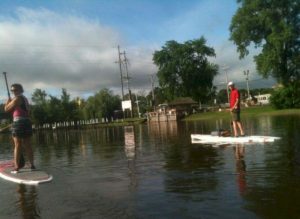 Here you will find where to launch your stand up paddleboard in the northern Fox Valley area of Illinois. The locations of the launch areas, costs, amenities and water conditions are reported on with first hand reports of paddlers that have been to these areas. 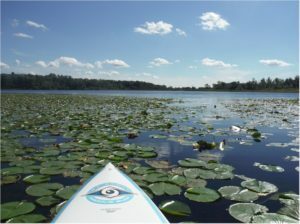 Now you can paddle board on the South Lake at Three Oaks Recreation Area. Alpine Accessories has set up a new launch area and storage shed just off the path west of the Lake House and the beach. The South Lake is a 330 acre lake that was formerly a gravel pit. The water is crystal clear and you can see fish, plant life and other critters below the water. Lessons and rentals will be available daily at the Board House from Memorial weekend to Labor Day weekend from 10:00 am to 5:00 pm weather permitting. Call 847-943-7043 between 10 am and 5 pm to make your reservation or for more information. Group rentals and lessons are available for groups of 8-15 people by reservation only. Walk ups are welcome. When Stand Up Paddleboarding at the Hollows Conservation Area you must wear a life jacket and there is absolutely NO SWIMMING allowed to protect the lake environment. The water is crystal clear and you can see fish and plant life below. The Hollows is at 14 Northwest Highway on the west end of Cary and is open from dawn to dusk. The McHenry County Conservation District restored this former gravel pit now covering 478 acres, and opened The Hollows in 1983. The facilities include a launch area, picnic tables, a shelter, drinking water, grills, restrooms and ample parking. 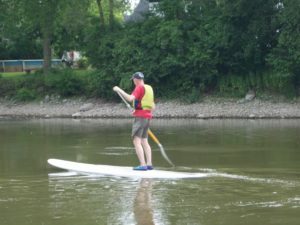 For those who do not yet have a paddleboard, the MCCD is hosts an annual Paddle in the Park every May at The Hollows. One can see demonstrations of paddling, test water craft and attend clinics. Paddleboards available at Alpine Accessories will be available for testing at this event. 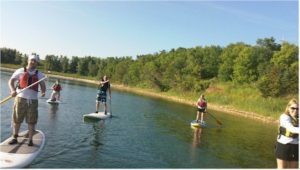 The annual Paddle in the Park at the Hollows Conservation Area put on by the McHenry County Conservation District offers paddle boarding clinics and informations given by Alpine Accessories staff. If you would like to take a full hour lesson call Alpine Accessories at 847-854-4754 for a reservation. Lessons will be given at the Three Oaks Recreation Area seven days a week starting Memorial Day weekend. 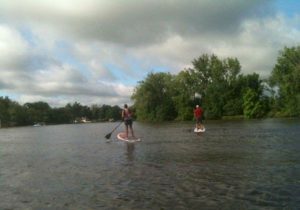 Paddleboarding in the Fox River at Riverfront Park in Algonquin is a great place to take off from. This area of the river is a No Wake zone. You would only head north on the Fox River as just a short distance south of this park is the Algonquin Dam. There are benches, a drinking fountain and ample parking (except for Thursday night concert dates). For public restrooms one would have to go to Cornish Park which is just south of Algonquin Road. 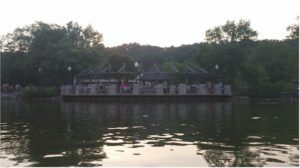 Go on Thursday evenings when the Algonquin Summer Concert Series are scheduled and paddle around the boats that are anchored while listening to the muscians in the pavillion. See the Algonquin Village website for the current seasons concert in the park dates. The concerts start at 7:30pm, but we recommend you get there early to get a parking spot as the concerts draw a large crowd. Riverfront Park is at 201 North Harrison Street just north of IL Route 62 / Algonquin Road and east of IL Route 31. Paddle boarding with the full moon gives one a new perspective on the water. Paddling is done at a slower pace. 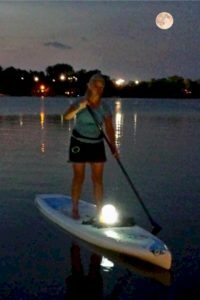 Bangs Lake in Wauconda Illinois was a perfect place for a moon light paddle. We saw a group of kayakers on our August 18th moon light paddle as well. To plan your next full moon paddle check out the Farmers Almanac calendar. There are a number of places one can access the lake. Anyone can launch at the Wauconda Park District’s Cook Park at 600 N. Main Street. Several restaurants around the lake allow launching for their customers. For safety one must have a light on board so others can see you. The Luci floating waterproof solar lights are perfect for this. The Luci Lights can be attached to your board from the handle on the top or bottom. The inflatable solar lights have 10 ultra bright LED lights, 50 Lumens, are waterproof, float and inexpensive at only $17.95. 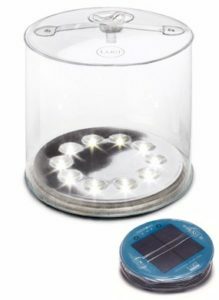 Luci Lights; solar powered, waterproof, floats! Residents of Lake in the Hills can take their paddleboards to Woods Creek Lake with a lake use tag and a boat permit fee or a daily fee. Your paddleboard also must have the IDNR paddle pass sticker. Lake Use and Boat Use tags can be purchased at the Village Hall. 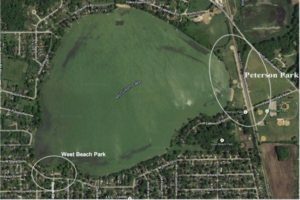 Paddleboards can be launced from Nockels Park and Turtle Island. For those who are Lake in the Hills residents a lake use permit is $40 and for non-residents the permit is $60. Residents will also need a boat permit fee of $10. 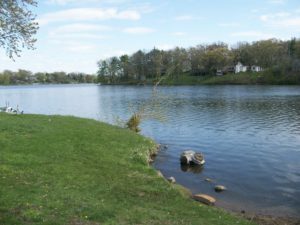 Non-residents will need a daily boat launch fee of $15. All paddle boarders are required to wear life jackets at all times. You can also rent a paddle board at Indian Trail Beach from 12:00 – 5:00 pm for $6/half hour or $11 per hour. A daily beach admission fee for residents is $2 and non-residents is $5. McCullom Lake in McHenry County Illinois is bordered by the towns of McCullom Lake and McHenry. This 244 acre lake is shallow at an average depth of 4 feet. The deepest part in the center is 10 feet. There is a speed limit of 10 m.p.h. for motor boats and skiing is not allowed, which is perfect for a quiet paddle with no waves. 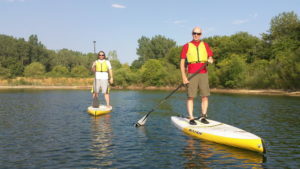 There are two areas to launch stand up paddle boards at; Peterson Park on the northeast end of the lake and West Beach Park on the south shore. Getting to either park is easy. To get to Peterson Park take McCullom Lake Road west from Route 31. To get to West Beach Park take Beach Road north off of Route 120. There is ample parking at both parks. On a Sunday afternoon the lake was quiet and calm. The only drawback was the murky water and seaweed. There are also water lilies that were in bloom. The McHenry Dam is part of the Moraine Hills State Park. From Memorial Day to Labor Day the park is open from 8:00 am to 9:00 pm. There is ample parking, restrooms, picnic areas and a sandy beach to launch your paddle board. If you go on the weekend launch right at 8:00 am to avoid boat traffic. If you go later in the day stop off at Kiefs Reef which opens at 11:00 am for lunch for some great food. 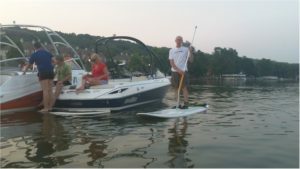 There is no charge for disembarking a paddle board at the Broken Oar. The restaurant opens at 8:00 am on the weekend for breakfast. 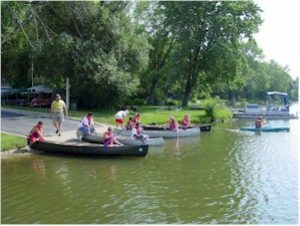 Two miles south of the Broken Oar there is the Fox River Forest Preserve with a launch ramp, piers, picnic area and parking. The preserve is part of the Lake County Forest Preserve and is open from 6am to 10pm. Past this preserve there are no public areas to stop for a 13 mile stretch until you get to Algonquin. Buffalo Park is a Kane County Forest Preserve park at the south end of Algonquin. There is no cost to launch your Stand Up Paddleboard at this park. There is ample parking, restrooms and picnic tables. Rick and I paddled upstream from Buffalo Park north to the bike path bridge. Paddling upstream is a great workout, especially at the bends in the river. The water level was very low and only about 15 inches at some points causing our fins to hit the bottom of the river bed. At some points we even pushed off the bottom of the river with our paddles. Once we reached the bridge that connects the bike path the water was very low with large rocks showing and the water was in a whirlpool. Up ahead we saw many more rocks and low spots so we decided to turn around at the bridge. Going back downstream with the current was a breeze. Even though the water was only 15 inches we could not see the bottom of the riverbed as the water was murky. The banks on this stretch of the river are lined with older single family homes. On the west bank you will pass the Algonquin Sanitation Plant, so the scenery and the smell is not the best. The Fox River from Algonquin to Elgin is lined by parks and forest preserves. At some points you can’t believe you are in the Chicago suburbs it is so peaceful. South of the Algonquin dam to the I90 bridge, which is about an 8 mile stretch, these are the parks to gain access to the water. Starting out just south of the Algonquin dam on the west side of the river is the Village of Algonquin’s Cornish Park and further south Buffalo Park a Kane Country Forest Preserve park. Last summer we paddled from Buffalo Park to the Fox River Shores Forest Preserve. 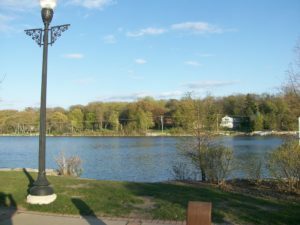 From Buffalo Park to the Fox River Shores you pass the Brunner Family Forest Preserve which recently received a grant for improvements that includes “600 feet of shoreline enhancements” which hopefully includes a launch area. You will see cranes and other wildlife along this stretch of the river. During the summers drought of 2012 there were a few areas that were so shallow that the fin on my board hit the bottom of the riverbed. I had to walk off the board and move the board to a deeper spot. This is a very good reason to wear water shoes when paddle boarding. If you make a stop off or end your trip at the Fox River Shores Forest Preserve on the east side of the river, you will have a great place to take a break. This park has a rest room, shelter, picnic tables and ample parking. After the Fox River Shores you will approach the Carpentersville Dam. There is a park on the west side of the river with ample parking and a launch area. Portage is on the west side of the dam between some shrubs on a narrow path. One could also start off at this point rather than try to portage around this dam. On the east side in Carpentersville is the Otto Engineering park. This is a privately owned park which allows public use. There is plenty of parking here and a launch area. One may have to kneel on their board to get under the Otto bridge, especially very tall people and when the water levels are high. In West Dundee on the west banks of the river is South End Park. Here is another nice park for a break where you have a canoe/SUP launch, picnic area, gazebo, restrooms and parking. The next stopoff would be Voyagers Landing. When going down the river you have to arrange dropping off your gear at the upstream park, leaving someone to watch over it, then have others drive to the downstream park to leave your vehicles there and carpool everyone back to the upstream location to start paddling. Or you could ask a non paddler drive to the downsteam location for the pickup. If you don’t want to go through this hassle, when you go paddling on the river you first paddle upstream, because you will be so exhausted paddling upstream you will need to take the easy way down with the current to get back to your vehicle. Rick and I have paddled upstream a few times and it takes 3-4 times as long to paddle upstream than the same distance downstream. The current around the bridges is very swift and is very difficult to impossible to get through going upstream. That’s the time to turn around for me. 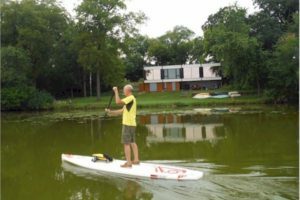 The Fox Valley Paddle Boarders is a group of paddle board owners who want to explore new areas to paddle in the Northwest Chicago suburbs. There are restrictions at many areas, where you must be a resident of where the lake is located or SUP is just plain not permitted. 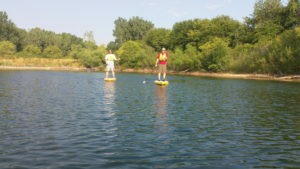 The purpose of the group is to help paddle boarders find the acceptable places to paddle board. 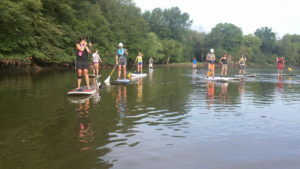 Any member can add an event if they want to get together fellow paddle boarders to a location that accepts SUP. 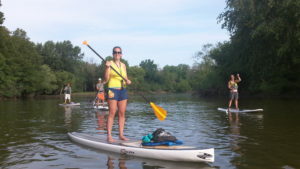 So, if you are interested in paddling down the Fox River with a group, check out our Meet Up page for upcoming journeys. We have had several groups of paddle boarders to take a trip down the Fox River on a beautiful Sunday morning. Kayakers have tagged along as well. The 7 mile paddle startes off at Buffalo Park in Algonquin IL where all the boards are dropped off and a few stayed to watch over them while the rest drive their cars to Voyagers Landing in Elgin. Everyone then piles back into two cars back up to Algonquin. The shuttle back and forth takes about 20 minutes on a Sunday morning with no traffic. The trip down stream startes at 7:30am and we arrive in Elgin about 11:00am. It is peaceful and quiet. We see cranes, eagles, ducks with their ducklings and fish. Some had fish that jumped out of the water and onto their boards. And the lily pads were in bloom. There was a portage at the Carpentersville Dam on the west side of the river. The area we pulled out of was narrow and mucky, however the area to put back in was wide open. Shortly after the dam was the old bridge by Otto Engineering. The taller guys could touch the bottom of the bridge which had about a 7 foot clearance. Not one person fell in the entire trip. A good time was had by all. Would you like to join us on our next excursion? Many say the Fox River is polluted because the water is not clear. In fact rivers are often cleaner than lakes as the moving water dilutes bacteria and chemicals. 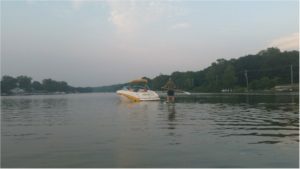 During the summer months we often hear of beaches on the lake being closed because of high levels of e-coli bacteria. Rivers become polluted from industry, agriculture and domestic uses discharging wastes into the river and into tributaries and creeks that feed into the river. Fertilizers from agriculture and home owners change the chemical balance of the river water which is often detrimental to fish and aquatic plants and wildlife. 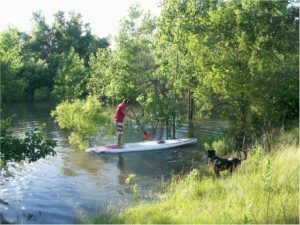 It rained so much in the Chicago area June 28, 2013 that the retention area behind our shop filled up deep enough for Sean and Rick to go paddleboarding. The retention area is about 5 acres and normally has no water. But when 3-4 inches of rain came down, it filled the retention pond with as much as 4 feet in some areas. The most water we ever saw in the retention area. So we had to go. Paddle boards can be used for getting around in depths of water as low as 12 inches or less if you take the fin off. Paddleboarding on a retention pond. 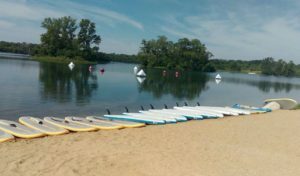 Paddle boarding is not allowed on any of the lakes in Cook County Forest Preserves, DuPage County Forest Preserves or Will County Forest Preserves. (Evidently any of the rivers are OK.) We have been told paddlers have been waved off many of these lakes not knowing it was off limits to SUP. Many lakes are restricted to property owners around the lake, such as Crystal Lake, Lake Killarney, Wonder Lake and many others. Paddle boarding can be very relaxing, but not on Lake Defiance in The Moraine Hills State Park. Lake Defiance is a small 48 acres lake. The entire perimeter of the lake has dense aquatic vegetation growing up to the water level and out about 50 feet from the shoreline. This vegetation gets caught on the fin of the paddleboard causing the board to slow down or even stop. That leaves an even smaller area in the center of the lake to paddle. To get to the lake from the parking lot requires one to carry their board 150 steps to the launch area which is also overgrown with vegetation.